Terroir. Getting into wine, you’ll hear this term a lot. It’s a catch-all term for the environmental factors that have an influence on the wine. Terroir used to play a factor in beer too: beer styles were developed according to the local water. Different areas have different hops and malts. And maybe most importantly: the local microorganisms gave each brewery its own unique character. With pure yeast fermentation, water treatment and globalization that allows a Swedish brewer to brew with New Zealand and Pacific Northwest hops as well as British malt. The location of a brewery plays less to no role anymore. That is, for most breweries. 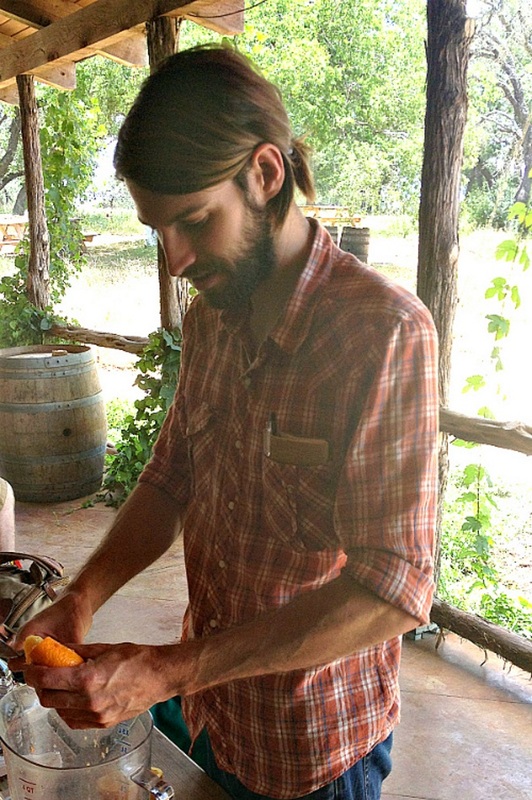 We sat down with Jester King’s Jeff Stuffings (Co-Owner etc. ), Garrett Crowell (Head Brewer) and Adrienne Ballou (Head of the Barrel Program) who ferment with their own mixed culture. And we talked about that and more. Deutsche Version des Interviews ist hier. Do you think a good brewer is a patient brewer? Garrett Crowell: Of course. I think time is your biggest ally. A lot of brewers think that their beer is bad, because it shows some hints of an off-flavor. But for us, working with a mixed culture fermentation, this has the mechanism to basically fix itself. It really is just a matter of time. Now, certain things like acetobacter, there’s no repairing that. But otherwise, pretty much anything has a solution and that solution is time. Do you ever struggle to be patient? Garrett: I can never wait for a beer to be ready, but at the same time, there are plenty of things to keep my mind occupied and not be so eager. In your interview with the Brewing Network you said something that I found rather interesting: You separated the wort production and the aging process. Maybe you can say something about that. Jeff Stuffings: I think so much of what gives beer its uniqueness is fermentation. I have heard other brewers say this and I agree: Wort making can be very forgiving, but fermentation will not. What we do here at Jester King is unique fermentations with native microorganisms. It’s kind of a throwback to a time of brewing history where there weren’t yeast laboratories or temperature control. Beer was made and fermented with just the organisms that happened to exist in various parts of the world. We think that imparts a lot of character in beer. Like for instance we are just labelling our Black Metal Imperial Stout. Which is a beer that when we started the brewery, we used a pure culture English ale yeast strain. The result was very predictable in the way the strain behaved. But along the way we switched over to our house mixed organisms which comprises of dozens and dozens of microorganisms, yeast and bacteria from our land. We put a quote from a Belgian scientist on the label of that beer, who did his work in the 20th century, effectively saying: The rise of pure culture fermentation in brewing did a lot for consistency, predictability and overall quality control. But it probably took away some unique character of beer. We really subscribe to that mentality. Do you always pitch the same house mix or do you vary between beers? Garrett: We always pitch the same, although our house culture is certainly evolving. But that really is the fun of it. The uncertainty. And learning with the yeast, as it goes. However, it has never really been altered. We’ve never really introduced a different microorganism other than what initially made it in there or what was in there from the beginning. So we’ve kind of developed this mixed culture, scaled it up to use in commercial batches, and those batches are from where all our yeast has come from since. Adrienne Ballou: There is an exception to that, which is a pretty interesting one. There’s a collaboration with Live Oak brewery in Austin where we kept their Hefeweizen wort and we actually pitched their Hefeweizen yeast at the same time as our mixed culture. So we’ve kind of got to see for the first time, how our mixed culture interacted with a lab strain yeast. After primary fermentation it was very much like a traditional Hefeweizen. But then it started to really evolve and take on some really interesting aromatics, picked up some acidity. So that is the one exception where we have pitched a lab strain. I heard that you change barrels after three times filling it with beer. Does that introduce new microorganisms? Adrienne: Every year we get new barrels from wineries, some of them in Texas, some in California and some in France. And each of these barrels has a unique environment of microbes. We pitch mixed cultures into everything, so there will be a lot of similarities from barrel to barrel, but there will be minor differences, which makes blending one of the most fun things of what we do. It all sounds very exciting, blending, having your own mixed culture. How can this be adapted for homebrewing? Garrett: Homebrewing is where I got my start. 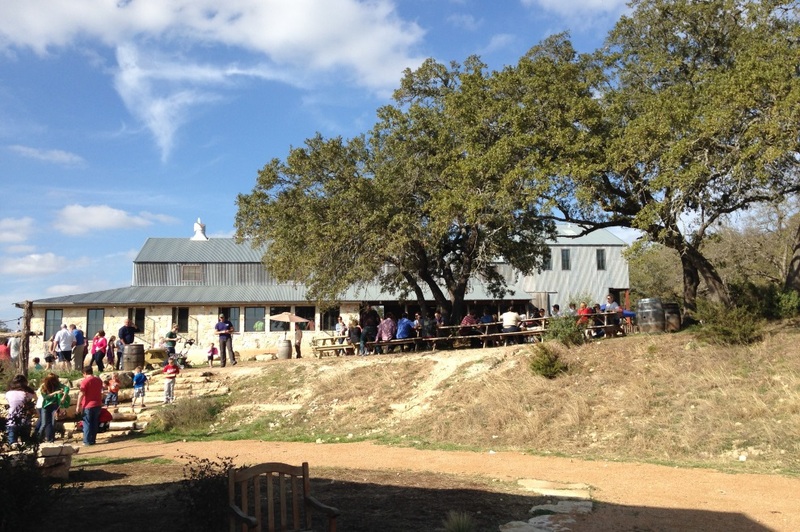 Jester King is my first professional job in the brewing industry. My process as a homebrewer was to just brew deviations of normal beers, pitch a lab strain. Then I would find all these sour beers or funky beers that were unpasteurized, mostly Fantôme and Orval, and during primary fermentation, I would just add an inch of that beer to the carboy or the bucked and introduce microbes that way. It is a really easy process and you get to drink a nice beer while you’re brewing. And as far as creating beers for blending, I think it is important to create very different beers. If they are all similar and you blend them together, it’ll all taste the same. But if you add, say a Red Ale, a Blonde Ale and maybe even a sour Stout, using those beers and experimenting with different blending ratios; that can give you a feel for what happens to a character once blended in a beer. Jeff: Another element for making good beer of these styles at home, then again this applies to any beer, is to pay close attention to fermentation temperature. I see a lot of homebrewers investing a lot of money into equipment, but I tell them to rather pay attention to fermentation temperature. Despite having a very hands off process at Jester King where we let nature take its course, we do control the temperature during fermentation. It will give you better results if you don’t just ferment with any temperature – which is usually too hot, and that is when problems arise. Although sometimes during the first few weeks of fermentation, temperatures do rise up particularly during the first summer weeks to between 83 to 93 (28 to 34°C). That can produce some very nice aromatics and flavors, but generally, and this is something I tell homebrewers, is to keep your temperature in check. How important does the laboratory get in a brewery like yours? Adrienne: We actually don’t have an official laboratory and we don’t really do any lab work. When I joined the brewery two years ago, starting off as the apprentice, I came from a university where I did a lot of lab work related to wine making. And I tried to do that a little bit, just looking at out our mixed culture, isolating different microorganisms. However, sensory aspects are more important in terms of quality control, rather than laboratory practices. Our mixed culture is constantly evolving and changing and we really accepted that we only have some control. We monitor temperature, we make sure we pitch healthy cultures. But the population of yeast and bacteria, it does change. But we embrace that. We like just slight inconsistencies. We think that makes our beers unique. Jeff: Because we don’t put consistency at the top of the pedestal, it gives us this creative freedom to just let our organisms go to play. So long as it tastes good, we are going to release it. It goes back in brewing history, where you have brewers that make beer in a very controlled fashion. The vast majority of brewers are very, very focused on predictability and consistency and control. Which makes sense from the perspective of running a business. But we take the total opposite approach. In the past you said that creating a new beer is a communal process. What do you mean by that? Jeff: To an extent it still is a communal process. But really over the last two or three years, Garret has really been in charge with developing our recipes while also guiding the division of our beer making. 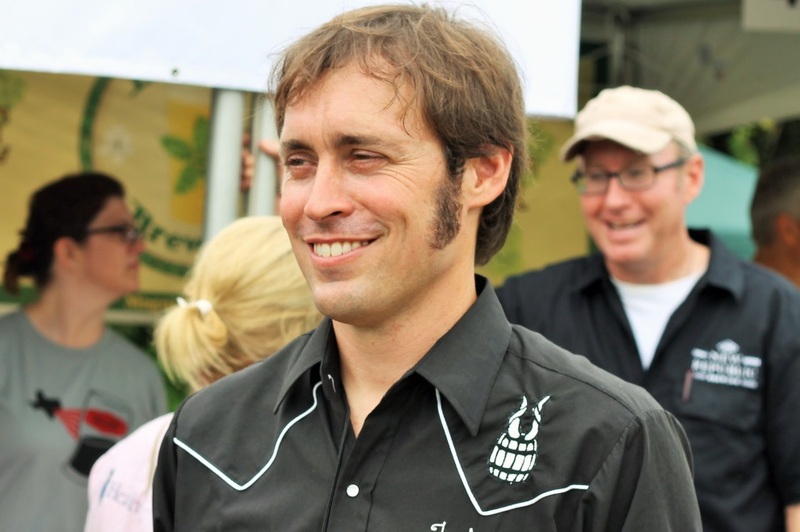 For example the mix culture, buying the ingredients, planning the time for the beer that Garrett created. There are a lot of smart people here at Jester King. There is also a lot of creativity involved in this, but Garrett really is guiding our vision. Can you take us through the process of creating a new beer? Garrett: I am really inspired by food. Like I eat somewhere and the chef uses a set of ingredient. Usually what tastes good in food tastes good in beer. However, I wouldn’t go as far as make a beer with BBQ or bacon or anything like that. And then also nostalgia: For me that is a really inspiring thing, like when I think of a smell from the time when I was a kid or I associate a certain smell with a certain memory. That’ll oftentimes be the source for an idea for a beer. We released a seasonal beer this last fall called Autumnal Dichotomous. We brewed it with butternut squash and acorn squash that was roasted or grilled over some old barrel staves. We also added white sage and longpepper. I kind of wanted the beer to smell like a pile of burning leaves which is a very nostalgic smell from my youth. Do you source your ingredients locally? Are you a “farm to kettle” brewery, so to say? Adrienne: We try to source as many fruits as we can locally, but there are some exceptions. 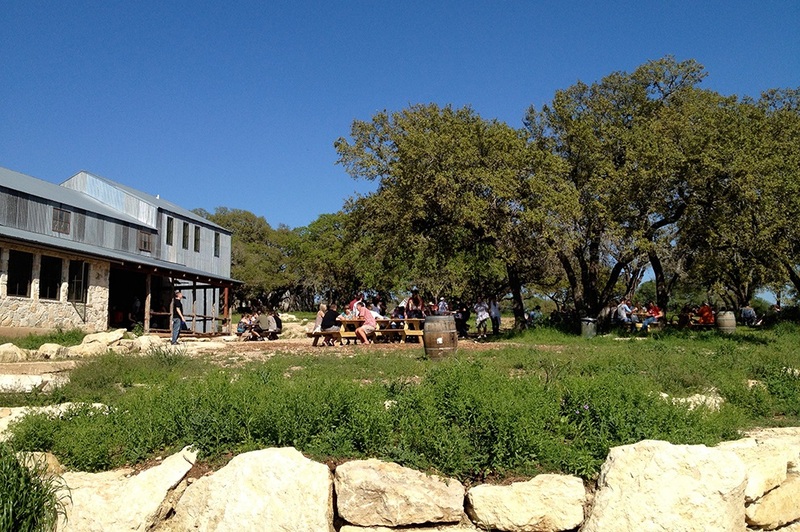 There’s a farm nearby in Austin that works with us for a lot of produce throughout the year. Unfortunately in central Texas we can’t really get things like Raspberries or Cherries. So we get them from out of state. Listening to you, it’s obvious how knowledgeable you are. How did you get that knowledge or maybe just as important, how do you keep growing this knowledge? Jeff: Nowadays we have great access to brewers, but also homebrewers and fans of beers have that. Especially when you go to festivals, brewers tend to be very modest down to earth people and are willing to talk to you. So talking to brewers, reading blogs and homebrewer websites; there’s a website by Michael Tonsmeire called TheMadFermentationist.com. For years now I have been enormously inspired by his writings and fermentations. Garrett: Drinking beer. I learn from that more than from anything else. In the sense that when I find a character that I like in a beer that I find out what it is. Plus I second Mad Fermentationist. I really sank my teeth into that website and learnt what made beer sour. 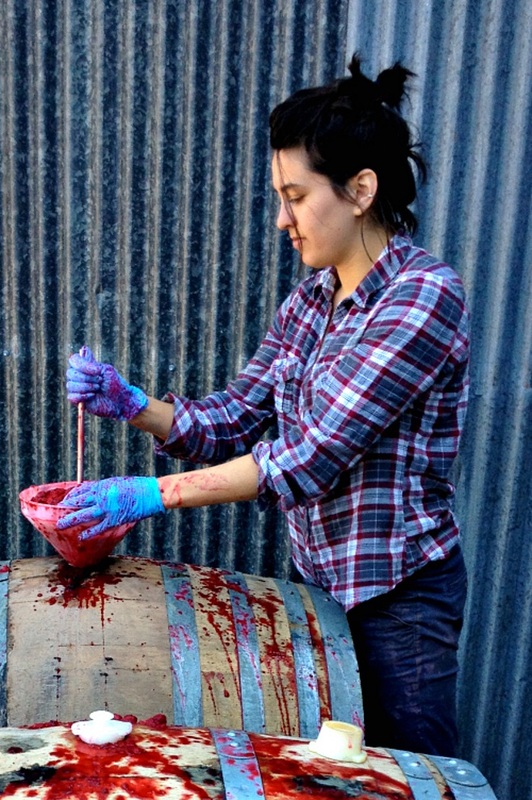 Adrienne: Even though I work in a brewery, a lot of what I experiment with comes from conversations with wine makers. So for me it’s also drinking a lot of wine, to see how that translate into brewing. Plus sensory characteristics of beers that I like. What beer of yours would you serve to the original beer hunter Michael Jackson? Jeff: That’s a tough one. Well, I have never met Michael and I only know him from “The Beer Hunter” and his books, of course, but he seemed to have been a really sociable fellow who enjoyed good conversation in the course of an afternoon or evening. So, maybe something low in alcohol which we could drink with him for a couple of hours. So maybe our table beer, which is called La Petite Prince. It is a very, very simple Farmhouse Ale. It is only about three percent alcohol. When it’s fresh it’s dry and you get a little more from the hops. When it’s older, it’s a little more yeast and bacteria driven, in terms of the flavors and aromas. Adrienne: That’s what I would have said too [laughs]. We asked the same question to Toby Munn at The Kernel and he also picked their table beer. So apparently nobody wants to see Michael Jackson drunk. Jeff: [laughs] Speaking of The Kernel, a couple of people from us are overseas right now and are actually doing a collaboration beer with The Kernel. Cool. Speaking of collaborations. You’ve done one last year with Raphaël Mettler from Trois Dames. Jeff: That’s right. We got to brew in St.Croix with Raphaël. It was a real honor and a real treat. We absolutely loved the brewery and beers. The setting was absolutely gorgeous. We’re going to see Raphaël at the Craft Beer conference in Portland, Oregon in just a few weeks. Jeff: One of the great things about the beer world is, it’s a really wonderful community of just really exceptional and friendly people. Part of what’s great about that community is you get to meet people from all around the world, which is really cool and something people in a lot of other professions don’t get to do. We met Raphaël at the Shelton Brothers festival when it was in Portland, Maine. We were visiting Oxbow Brewery and a friend of mine, Nathan Zeender who brews at Right Proper Brewing in Washington D.C. introduced me to Raphaël. We kind of bonded over the course of the festival and talked about making a beer together. So we went to St.Croix and he came to us. It is a collaboration between Trois Dames, Crooked Stave Artisan Beer Project in Denver, Colorado and us. We brewed the same recipe in all three different locations. Same recipe, same type of barrel – Spanish Sherry barrels – but then different fermentation profiles. We used the house cultures of each of the three breweries to really impart different characteristics based on how each brewery does their own fermentation. What’s the current state of the beer? Jeff: Ours is in bottles and ready to drink and we are going to release it this month with Raphaël and Chad Yakobson of Crooked Stave in Portland. When we talked to Raphaël about the project, he mentioned that he wasn’t allowed to do any of the work, so I guess it was Garrett and Adrienne that did all the work? Adrienne: Yes, it was kind of a strange day, as the collaboration fell on the same day as a TV crew being at the brewery filming us. They were very kind but also a little bit pushy, as they wanted to get a lot of things on film. So it was kind of hard to maneuver around the cameras all day. Giving everyone a chance to brew and work in the brewery. Garrett: Yeah, there were a lot of people at the brewery that day for a week day. The photo you took in Raphaël’s cave also looked somewhat crowded, but it also looked like you had a lot of fun. Garrett: It was a lot of fun. Jeff: Yes, it was nice, Raphaël got to go on a little walk around the ranch we are located at. We are on a property of about two hundred acres southwest of Austin, Texas. I think he enjoyed to see where we live and some of the stereotypes about Texas. Any other plans to brew with European breweries? Jeff: We are planning two overseas trips this year. One that is currently going on includes The Kernel and then we also helped Oersoep in the Netherlands make a beer. How do you chose collaborations? You meet someone, you like someone, you brew with someone? Jeff: That’s part of it. But their philosophy is very important. We want our collaborations to be authentic in the sense that the beer is hopefully better than the sum of its parts. And that it wouldn’t have happened on our own respectively. Meeting brewers and drinking their beer gives a sense of what they are passionate about and if it falls in line with what we are passionate about. It’s usually pretty obvious if there’s a chance that we’d create something special by collaborating, based on who they are and what they believe in and what their process of brewing is. And when the collaborations are really, really good they result in a beer label with two naked men on it? Garrett: [laughs] I wasn’t completely naked. I was wearing a fig leaf! That label looks like it led to a few sleepless nights for your designer. Was that label based on a photograph or pure imagination? Garrett: Josh’s [Cockrell] imagination, our artist here. That label was done for a beer with Prairie Ales. Another collabo you’ve just done was with Jeppe of Evil Twin. Jeff: Jeppe is great. It was personally fun for me because he brought his family to Austin too and so my daughter got to play with his two sons. You’re not just brewing with Europeans, travel to Europe, but sometimes we are even so lucky that you’re beers are available in Europe. Some time ago, Sam Calagione from Dogfish Head announced once that he’ll not export because he’s not even able to cater to all the demand in the US. You seem to go a different route. Jeff: Yes, some of our beers go overseas in connection with festivals. We have to take one step back though. We used to send more of our beers to other States in the US and overseas, because it was illegal to sell beer at our brewery. Fortunately about two years ago that law changed. 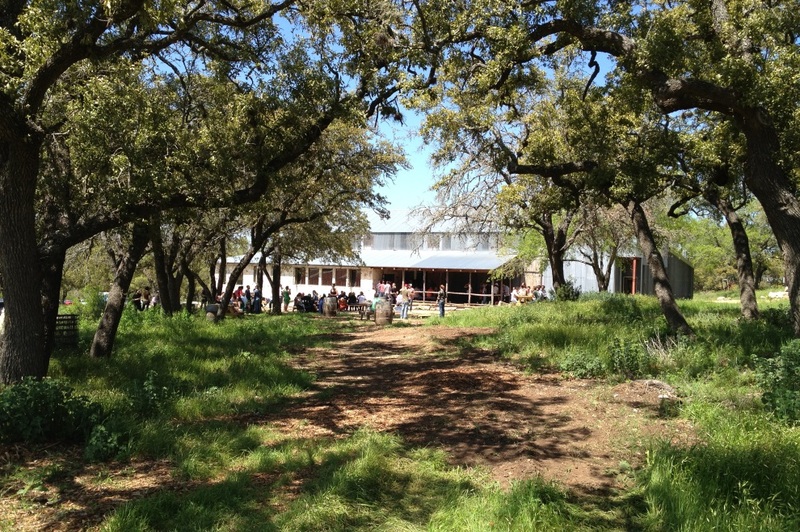 In fact, now we can sell our beers here at Jester King. So we are actually at a stage where we don’t have that much beer that we could send abroad. But we still chose to send a little bit out. Because we want to be part of this multi-national community of beer and brewers. We enjoy and we get great inspiration from meeting other brewers and having our beers in other parts of the world and getting to travel and collaborate. That’s really why we do it. I think beer drinkers sometimes can be a little territorial. In Texas for example, there’s a very strong state pride mentality. If it is not beer from Texas then it is not worthy of support. We never subscribed to that at all. Our inspiration comes from a host of different places from around the world and thus we want to be a part of that world. Speaking of Texas: The stereotype includes long horns, Lonestar, guns and maybe farms, but not necessarily Farmhouse. How were or are your beers received in your home state? Jeff: We were quite pleasantly surprised how well our beer was received from the very start. We were told by a brewer that the beer we planned to make was not commercially viable. Fine, that might happen. But then we’ll sell our beer where it’ll get accepted – out of state or overseas. Personally I think that our timing was good and the Texas market was ready for something a little out of the mainstream, the Anglo-American or German style beers. You initially intended to brew the more English beer styles. Have you ever thought about creating a spin-off and return to those styles of beer? Jeff: Right out of the gate we were inspired by the low alcohol session beers. A mild was the first beer we’ve ever made. But we were also inspired by these wild ales, these Farmhouse style of ales. Mainly from breweries like Jolly Pumpkin. So we initially intended to do this hybrid approach. Garrett: I think we make them, but they are deviations from what you might consider a classic IPA or a classic Stout or a classic Pale Ale. Everything is fermented with our mixed culture and that by itself adds a pretty different dimension to our beer in comparison if the same recipe would be brewed by Sierra Nevada. Garrett: Right now, we just finished up our spontaneous brewing season, as we are transitioning into the warmer season here in Texas. As it warms up we’re able to ferment our more regular dry-hopped ales. Our brewery is kind of exposed to the outside, so we need a warmer outside to carry our yeast fermentation. And beyond that is fruit season, which’ll last until late or early fall. Adrienne: This summer, in terms of fresh fruits that we are going to get, we are going to focus a lot on peaches again. Hopefully from the Hill country. Apricots are another fun project. Fruit season is always exciting for us. And you don’t seem to be looking for the next exotic thing but rather just flavors you enjoy. Lastly, our traditional last question: Which five beers would you suggest anybody should drink before they die? Jeff: Definitely. It is a Czech style pilsner, brewed right here in Austin by Live Oak Brewing. They use the traditional approach of a single concoction, Saaz hops, cold horizontal fermentation. Speaking of which, let me throw out the second suggestion Taras Boulba from De La Senne in Brussels. Yvan De Baets, the brewer there, has been an enormous inspiration for us. That beer is an incredible blend of dryness, yeast character, hop flavor and aroma, and it’s just a really drinkable and enjoyable beer. Garrett: I would also put Fantôme Saison there. Just because, it’s certainly not the most consistent or reliable Saison. But I think that’s what makes it really what it is. For me it’s one of the most honest representations of inadvertent house character, in the way that a beer is truly influenced by its surroundings. It’s a really amazing thing. Beer can be so strange but so beautiful at the same time. Adrienne: I would say Cantillon Vigneronne. That beer was really inspirational for me: I came from the wine industry, and that was the first beer that I’ve had, that truly inspired me to find ways to connect the two worlds. And every time I have that beer I feel more and more inspired. Jeff: One that was, at least for me, hugely inspirational, just getting into beer: Through a friend from the Midwest, I managed to try a beer by Jolly Pumpkin. It is one of, if not the most pioneering American farmhouse breweries. I remember drinking their Calabaza Blanca, their Belgian style white ale, which was probably the first mixed culture beer that I’ve ever tasted. They pitch an ale yeast, but then they allow fermentation to be open for a period of time and then they rack the beer into barrels with a lot of different types of micro-organisms. The tartness and that kind of spicy funkiness of the beer was really eye opening to what beer can be. That beer is very special to me. Nice article, Christian. Very interesting!